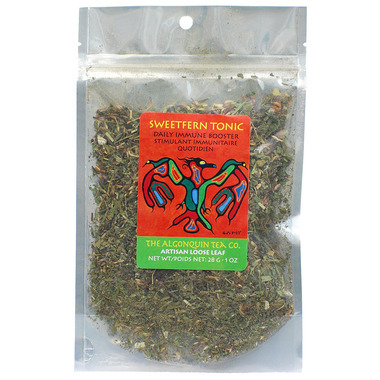 Algonquin Sweetfern Tonic Tea makes a delicious and healthy gentle tonic that can be enjoyed daily. Sweetfern Tonic is carefully formulated to assist every organ in the elimination of toxins. It tastes like black tea and helps clear lymph, blood and skin. Very gentle, nice flavor. Will buy again. This a lovely tea. Tasty and health-promoting. I love this tea. Tastes lovely with a bit of honey. An excellent gentle daily detox. I love this tea! Excellent tea. I drink a cup everyday and feel great.